Review written by and copyright: Eric Cotenas (6th April 2019). The treacherous California wildlife trail that is known as Devil's Path was also a popular gay cruising ground in the 1990s. The mating dance that is assessing whether another man is in the park for the same reasons can prove just as dangerous – what with the mounting series of disappearances of young men whose likeness are put up on a weekly basis by Park Ranger Tom (Nine Lives's Steve Callahan) – and simple assumptions can be deadly as Patrick (The Broken Rose's JD Scalzo) and Noah (3-Day Weekend's Stephen Twardokus ) are about to discover one weekend. An EMT desperately in need of blowing off steam, Patrick is only looking for one thing on the trail, and it is not the meaningful connection quiet and solitary nature-loving Noah naively assumes one can find with a total stranger. No sooner does Patrick dare Noah to walk the closed-off trail with him than Patrick is ready to abandon Noah whose interrogation of Patrick's lifestyle becomes a series of rebuttals. When Noah goes off to relieve himself and does not come back, Patrick goes searching for him and passes one of a pair of gruff-looking men (Confessions' Jon Gale and The Treehouse's Michael Hampton) with whom Noah had previously run afoul. He discovers a cowering Noah with a bloody gash on his head, and the reappearance of the two angry men carrying big sticks sends them off the path and deeper into the woods. Disagreeing about whether to get back onto the path or to follow a creek downstream, the combination of Patrick's asthma and Noah's anxiety attack forces them slow down and seek out shelter as night falls. The apparent successful evading of their pursuers only serves to ramp up the tension between them when Noah reveals the real reason that he is in the woods. The directorial debut of Matthew Montgomery (Socket) after nearly twenty years of making a name for himself as an actor in primarily gay independent film, Devil's Path utilizes a thriller setup along with somewhat of a gay spin on Gus Van Sant's Gerry (the slang term name of the two protagonists of that film also being the shared name under which the unnamed characters played by Gale and Hampton are credited in the closing credits cast) by way of Stranger by the Lake, to raise the stakes on the already dicey proposition of assessing shared sexual attraction between to strangers (with a violent reaction already more of a possibility when the strangers are both men and only one of them may actually be doing the cruising and the other may either be unsuspecting or setting up the other). While in some thrillers the viewer comes to realize the economic or staging convenience of the overt menace being largely unseen, Devil's Path can only play for so long with the ambiguity of whether sounds and shadows are the pursuers or whether one or the other of the protagonists lies about spotting them for purposes of deflection before the film starts to drag as it does towards the middle before it picks up again as one of the characters shows his hand. The end result is an uneven thriller that is nevertheless unafraid of alienating an audience who might reject gay characters who are neurotic and/or psychotic unless the tone is campy. Shot on high definition video, Devil's Path gets a typically serviceable progressive, anamorphic encode from Breaking Glass Pictures. The murkiness of some scenes might be helped slightly with a higher bitrate but is presumably a deliberate effect of the color grading. The Dolby Digital 5.1 soundtrack is appropriately front-oriented for such a talky film with directional effects employed during the more action-oriented scenes and mainly atmosphere straying into the surround channels. There are no subtitles or caption options. Extras start off with an audio commentary by director Matthew Montgomery and actor JD Scalzo from which Twardokus is unfortunately absent as the film's writer and co-lead. They point out not only the various visual clues to the film's nineties setting but also more subtle hints at the nature of one character's relationship with another, how cooperative the locals were with the project, various friends who had small roles in the film, as well as the insistence of cinematographer Stephen Tringali (The Ice Cream Truck) in laying down dolly tracks even on uneven terrain to vary the look of the film. Montgomery mentions that his husband, actor Callahan who plays the ranger, was responsible for keeping the production going even when it had to stop for a month when wildfires hit the location (Montgomery and Callahan had were previously co-leads in the Role/Play which from its synopsis sounds like it shares some elements with Devil's Path in having two opposed deconstructing one another). A selection of behind the scenes interviews (13:45) includes comments from Montgomery, Scalzo, Twardokus, Callahan, producer/actor Gale – who previously collaborated with Twardokus on the virtual two-man show An American Ghost Story – and cinematographer Tringali. Also included is the film's trailer (1:35) and trailers for other Breaking Glass releases. 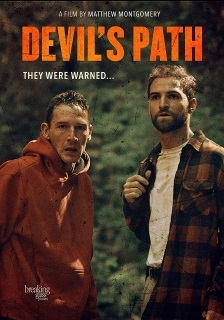 Devil's Path is an uneven thriller that is nevertheless unafraid of alienating an audience who might reject gay characters who are neurotic and/or psychotic unless the tone is campy.